Today we begin our presentation of the three Jurors who are evaluating this year's contender. First, in alphabetical order is Robert D. Kennedy, who's got some 500,000 seats on his account, from Glasgow to Gujarat. 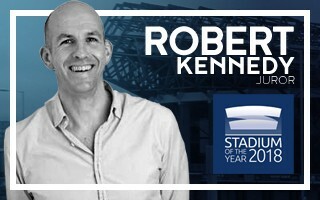 Working on his first stadium project in 1992, Murrayfield Stadium, Edinburgh, for the Scottish Rugby Union, Robert didn’t realise that this would be the start of a now 27 year relationship with stadia design. As an architect, then Partner in the Glasgow architectural firm The Miller Partnership, he would have an opportunity to work in the most exciting period of UK stadia design. Now a director in Holmes Miller he has constructed almost 500,000 seats in the UK and abroad and sees no end to the ongoing evolution of stadia and arenas. Highlights along the way include the RICOH Arena in Coventry, King Power Stadium in Leicester and the aforementioned Murrayfield Stadium, which at 67,500 capacity is the largest for the practice so far. The market has changed and the practice have been successful overseas with the completion of the Ahmedabad Arena in Gujarat, India and the design of a soccer tournament hub in New Jersey, USA. This international market will be a focus in the coming years, with Holmes Miller Architects having an office in Guangzhou, China and the need for sporting venues not relaxing soon. Although work close to home is still being done, as proven by redevelopment of the iconic Meadowbank in Edinburgh.